There is no limit to how creative you can be when it comes to container gardening , and there are many advantages to potting plants rather than transferring them into beds. You can even grow your own herbs, fruits, and vegetables in containers on your porch or kitchen windowsill. Making choices about which plants will thrive in tighter spaces and selecting what pots to use can be a bit overwhelming for beginners, so here is a brief introduction to get you started with gardening in containers. The size of the pot will determine what you can grow in it. Smaller pots can only accommodate one or perhaps two plants that do not spread and tend to stay relatively small. Large pots can comfortably house bushes, shrubs, even small trees. You can also plant combinations of smaller flowering plants and grasses in a container for a living bouquet effect. Selecting the proper size container for your plants is essential to their health and ability to flourish. If you have a plant in a small pot and it starts to wither, discolor, or generally act unhappy, switching it to a larger size container can sometimes make a difference. 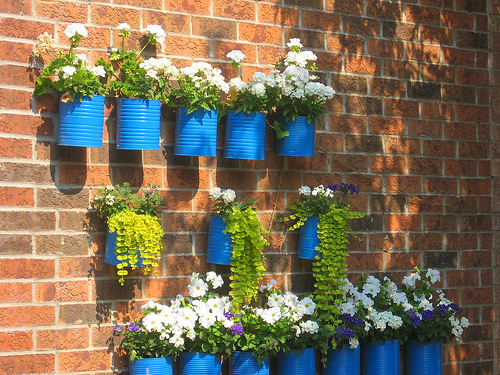 Container gardening is a great way to keep flowering plants no matter where you happen to live. If your residence is in an urban environment, you can artfully arrange the pots and plants on your porch or balcony. For those who are suburban dwellers, decks can become an oasis of greenery and color. And even if you have no outdoor space at all, plants in containers can thrive indoors as long as they receive adequate amounts of sunlight and water. Do not feel limited by your environment, as there are always plants that will thrive wherever you have the space to put them. It is also possible to grow just about any type of plant in a container, including fruits and vegetables. However, like flowers, there are certain varieties of vegetable and fruit plants that do better in containers. Smaller tomatoes such as the Tiny Tim and Pixie varieties do well when planted in 5 gallon pots. And it is also important to support vine and stalk plants with cages or trellises when they start to bloom, as the fruits will be more susceptible to rot and mold if they are left lying against the dirt in the pot. Relieving the weight of the fruit from the plants also makes them grow healthier and sturdier stalks. So for those who have always dreamed of having a garden but don’t know where to start or are overwhelmed by all the possibilities, pick one or two plants that you like and find a couple of cute pots. 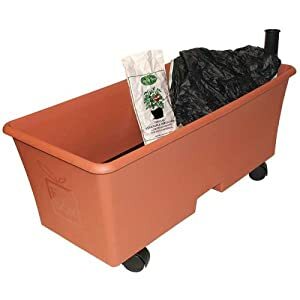 Just make sure that you select pots that are the proper size for the flowers or vegetables that you wish to grow and then place the potted plants in a spot that gets enough sunlight. Very soon, you will be sporting a green thumb and you will have mastered the art of container gardening.